Budget carrier Ryanair has said that passenger numbers rose 6% year-on-year to 8.1 million in July, the highest figure recorded by an airline in Europe in a single month. Passenger traffic for the year to the end of July stood at 75.9 million. The passengers are likely to have taken out a comprehensive travel insurance cover before boarding the aircraft. Ryanair also reported a 1% year-on-year rise in its load factor to 89% last month, while the figure for the year to the end of July was 83%. The load factor is a measure of how much of an airline's passenger carrying capacity is used. 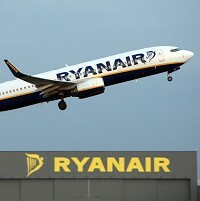 Stephen McNamara, from Ryanair, said: "Ryanair's record 8 million July traffic means Ryanair has carried more passengers in the month of July than Aer Lingus will carry on its short-haul network in all of 2011. "Ryanair has become the first European airline to carry a record 8 million passengers in one calendar month."